Learning how to use your fridge effectively is a great way to maximise the value of the food you buy and keep a well maintained kitchen at all times. It can be difficult to start using your fridge effectively if you have got used to just bunging everything in there and finding dodgy things at the back months later. While sorting out your fridge may sound like one of the most tedious tasks in the world, having a well organised fridge gives a sense of order and satisfaction to even the least domesticated person, not to mention how much more effective it is at saving your hard earned money. Without a well organised fridge, it is too easy to do your weekly food shop and just buy whatever you fancy, forgetting what you may already have or what leftovers you could make something tasty from. The best place to start is, as it usually is, at the beginning! Set aside an hour or two to really clean out your fridge. Start by emptying out all of those random bottles and jars, not to mention those unidentifiable furry things at the back. Check the dates on everything and keep as much as you can, but throw away anything out of date or that has been opened for longer than the bottle or jar recommends. Run a sink full of hot soapy water and get cleaning! Make sure you gently clean all of the filters, panels and drawers – take out any that are removable and soak them in the sink. Many fridges suggest that you do not use harsh cleaners, so stick to a soft cloth, hot soapy water and a bit of elbow grease. Once you have cleaned all the bottles etc that you are keeping and the clean drawers are replaced, you can start your new, impressive fridge regime! Keeping your fridge clean will be far easier now that you have a clean fridge to start with – don’t let it get grotty again and it will be easier to keep on top of. Assign the bottom shelf to raw meats, with the shelf above it for cooked meats. Use the vegetable drawers to keep your fruit and vegetables fresher for longer. It is a good habit to get into keeping jars and bottles in the door of the fridge as you will be able to see them more clearly. That way, if you have used half a jar of pesto, say, one day, you can think of another way to use it up within the next three days, rather than just finding it at the back of the top shelve three months later. Another way to make sure you are using your fridge effectively is to allow any hot food you want to put in the fridge to cool down first. Putting hot food into the fridge reduces the overall temperature in the fridge, which can be detrimental to your other things in there, not to mention making your fridge work harder and use more electricity. Some highly effective people swear by keeping a list on the outside of the fridge of what there is inside. 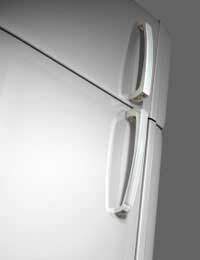 This stops you having to open the door all the time – which takes more electricity to cool it down again – and stops you wasting leftovers as you forget all about them.